AFRICANGLOBE – I listened to as much of President Obama’s Chicago speech today as MSNBC and CNN would allow, with interruptions for advertisements and comments from “experts” unknowledgeable about Chicago or education. The president was appropriately passionate about the tragedies of Hydia Pendleton, acknowledged the presence of Haydia’s parents and spoke passionately also of the murdered children and teachers of Sandy Hook. He talked about his own absentee father. As a child of poverty who grew up in Chicago aware of who my college educated father was, but never touched, never spoken to by my father, I could relate to President Obama’s wish that his college graduate father had parented him. 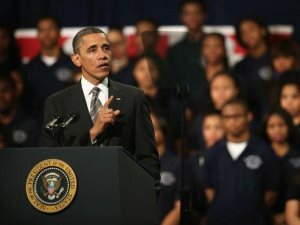 President Obama spoke of the need for more comprehensive pre-school education, of better education at all pre-college levels, about the ever increasing gun violence and killings in his adopted city. However, there was no mention of police killings of citizens or unfair justice, arrests and imprisonment. He gave his typical, inaccurate version of the founding of America: ” No matter who you are, if you work hard you can achieve your dream”. What President Obama avoided discussing, as is his custom, was any mention of the race of the students who sat behind him, almost all Black, of the mostly Black audience, of the systemic racism in uemployment, in public education, in housing, health, of the disparate civil and criminal justice which takes many Black fathers away from their children. What was comforting was that on the few occasions the president mentioned his former chief of staff, Mayor Rahm Emanuel who was present, there was almost silent response, some indication that the community and students of my hometown are no longer beguiled by the heartless mayor who is in the process of closing many schools and who has hired two incompetent CEOs for the Chicago Public Schools, both trained by the extremely conservative Broad Institute for Administrators. The president does not seem to recognize or will not acknowledge that improved registration and gun restrictions will not prevent the increasing Black on Black gun violence. What is more likely to lessen Black on Black violence and murders is curriculum and instruction that teach young Black people of the heroic accomplishments of ancestors and contemporaries, of their own value of themselves, their families and their communities, and an understanding of systemic oppression which must be recognized and resisted. They must learn that we are our own best friends who must protect each other. Teachers and administrators must be trained to appreciate Black and other people of color. They must be trained to recognize the possibility, even likelihood, of their own biases against people of color, especially those impoverished. Black and other teachers and administrators of color are not immune to their own racial and class biases. Such training will not occur in Teach for America boot camps or in present day undergraduate and graduate programs that pretend the charade that we are in a period of post racial America. But we must pressure those programs to do so. There will be no better advocates for Black and other students of color than Black educators, clergy, politicians, communities of color and the students themselves. Such advocacy will not be initiated by present or future occupants of the White House. It must be forced externally. The president’s speech was given at the Hyde Park Academy High School, where my lifetime friend the late Dr. Weldon Beverly was a former principal. By; Donald H. Smith, Ph.D.